Buying a mattress is no small decision. You’ll spend more time on your mattress than on any other piece of furniture—nearly a third of your life. It’ll be the center of your rest for years to come and you want to be sure you’re making the right decision for your comfort. Here’s what no one tells you about buying a mattress. “You get what you pay for,” is a common phrase when making any buying decision, especially larger purchases. For mattresses, the assumption is that the most expensive mattresses will be the most comfortable or the highest quality that will last the longest. However, this just isn’t true. Any mattress over $1,200 is generally only more expensive due to price inflation rather than any significant difference in quality. In fact, mattresses in big box stores will have the highest markup of any piece of furniture to get the biggest profit margin out of them. In some cases, there may be slightly more padding and coils in a more expensive mattress, but nothing to justify the hefty price tag. Every brand’s definition of what constitutes “soft” or “firm” is different. One company may label a mattress “soft” while another might make a mattress of the same firmness and label it “medium firm.” There’s so much difference between them that experts say that the terms are largely meaningless, at least for the consumer. It’s simply based on personal interpretation. The only way to discover if a new mattress is right for you is to get a feel for it by lying down on it. You should take advantage of free trials or any showroom opportunities to test how comfortable a mattress feels to you. A good rule of thumb is the one from Goldilocks – the mattress shouldn’t feel too soft or too firm. A mattress that is too soft might make getting comfortable difficult, whereas a mattress that is too firm won’t provide the right joint support. Conventional manufacturers use harsh and potentially dangerous chemicals when producing their mattresses. These chemicals are meant to make mattresses fire resistant or longer lasting, but they can leech into the air and potentially cause future health problems. Furthermore, the chemicals don’t prevent common pests such as mold, mildew, or dust mites. 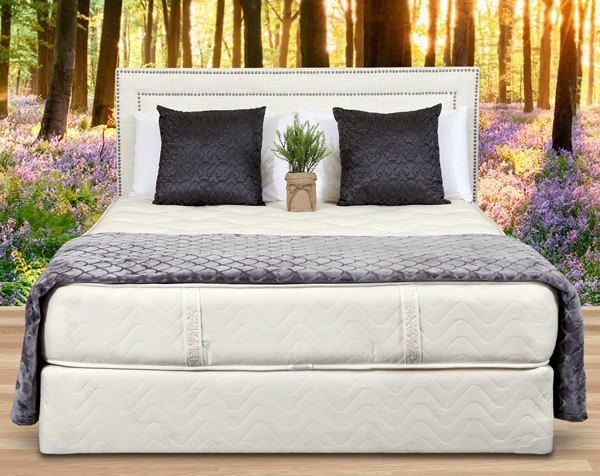 Fortunately, there are natural and organic mattress materials that can be used in lieu of traditional, chemical-laden mattress materials, such as organic cotton, natural wool, or Talalay latex. Not only are they free from potentially hazardous additives, these materials help keep mold, mildew, and dust at bay. Organic wool can even regulate your body temperature while you sleep. As a bonus, they’re still affordable when compared to traditional mattress consumer. Buying a mattress from a large, commercial factory outlet or a big box store might seem more convenient for shoppers with busy lifestyles. However, purchasing a mattress from such a store could mean engaging with less knowledgeable staff members, coupled with higher price markups and high pressure sales tactics. A small, local mattress company, such as Gardner Mattress, will have more informed staff members available to help you find the perfect mattress for you at an affordable price. They can also make a custom order for you to ensure you buy the best mattress for the best night’s rest possible. At Gardner Mattress, we use the highest quality organic materials and time-tested designs to make sure every customer can buy the right mattress for them. We even offer a 90-day trial so you can be confident in your purchase. Call us at 1-800-564-2736 or visit us to learn more and start investing in your rest.